This was taken some time ago- it is a huge crop-thought it would look best as a painting. Topaz impression and many tweaks. Cindy, love the texture, don't know if it's canvas or paper, but it works perfectly. Actually, it looks more like a water color painting to me. 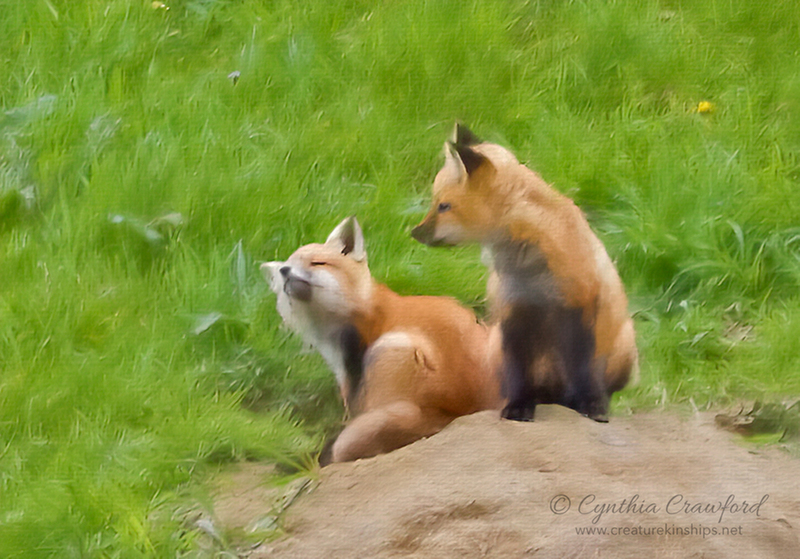 Wonderful capture of this pair of kits – and great timing to capture the scratch of the itch. Also, I feel the pose of the two on the boulder, with one scratching, is ideal. The green grasses form a perfect backdrop and are painted beautifully. A lovely and artistic piece! Thanks Ron-I don't know what medium I'd classify this as....doesn't much matter, but the "paper" reminds me of what I might use for pastels. By the way, they are actually sitting on the dug up dirt just outside their den-the smoothing out of it does look more like a rock. Everything that Ron said plus I love the poses. Not only the one scratching but the other one with head turn towards its sibling brings the two together beautifully!